Welcome to Xclusive Formats. We create formats for Television & Radio, we supply Games and Quizzes for Holiday Parks and Hotels and bespoke Game shows for Corporate events. I can also increase your sales and business as an experienced copywriter., direct marketing and advertising. We also have a Design and build service. Lee Carroll's "Run With The Ball" broadcast by HTV Television is an example of our work. 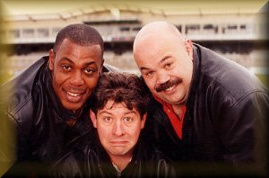 The picture on the right shows Lee Carroll with Gareth "Coochie" Chilcott and David "Syd" Lawrence. For more information on any of our services Call or Email Lee Carroll. Details can be found by clicking on the "Contact" tab above. Lee Carroll, format writer and presenter of "Run With The Ball" with Gareth "Coochie" Chilcott and David "Syd" Lawrence. The change format rights for Run With The Ball are owned by Lee Carroll.